Updated on 8/3 at 5:35 p.m. with more comment from Walk SF. According to the San Francisco Police Department, bikes and people are now cars, and everyone is responsible for committing the five violations that kill and maim San Franciscans the most often. The SFPD has proclaimed that its data-driven “Focus on the Five” enforcement campaign against deadly driving now also targets bicycle and pedestrian violations. In a press release issued Wednesday, the department espoused the misconstrued application of crash statistics used by Park Station Captain John Sanford to justify a crackdown on bicycle violations. Yes, in the SFPD’s re-definition of the most dangerous behaviors on the streets, even people on foot can commit the top five violations that, according to police data, most frequently cause traffic violence: Running red lights, violating the pedestrian right-of-way, speeding, running stop signs, running red lights, and making illegal turns. These 5 deadly behaviors are the top primary collision factors, which are assigned to every collision involving injury. Pedestrians, cyclists, and motorists are all subject to citations if the violations are committed. Furthermore, all 5 of these violations can be committed by the same 3 parties. While a traffic collision involving a vehicle may cause more injury due to simple physics, it does not mean that cyclists or pedestrians are incapable of also causing injury. 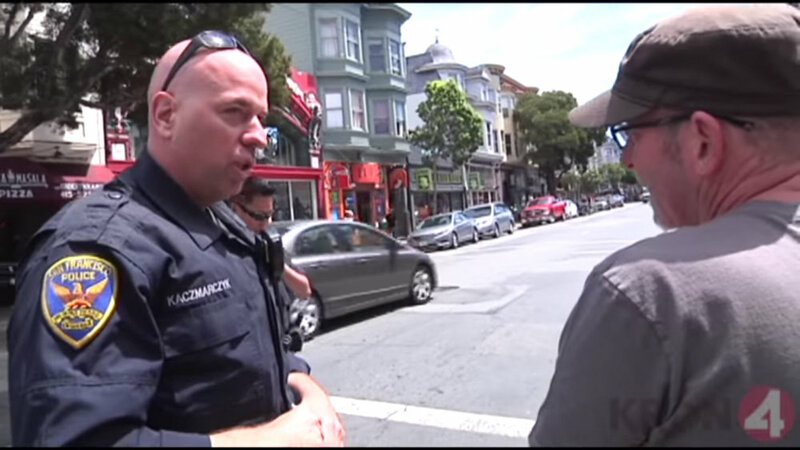 The SFPD’s attempt to revise the narrative is brazen, given that virtually all statements and reports from SFPD and other agencies thus far have specifically discussed “the five” violations as driver behaviors. For starters, the SFPD presents separate categories for citations issued to bicyclists and pedestrians in its quarterly reports on “Focus on the Five” performance data. Citations for “the five,” and other motorist citations, are presented separately. The point of the campaign is to make the most efficient use of SFPD’s limited enforcement resources to reduce traffic injuries. But 19 months in, every station except Richmond has still failed to meet the goal of issuing 50 percent of tickets for the five violations that most often hurt people. SFPD Traffic Company Commander Ann Mannix, who has expressed reluctance to meet the goal, told a supervisors committee in May that “we won’t change much” this year to reach 50 percent. Mannix has attributed Richmond’s “Focus on the Five” success to the district’s low non-traffic crime and abundance of stop signs. At a Richmond Station meeting last week, Mannix encouraged residents to write complaint letters to the SFPD and newspapers about bad bicycling behavior to show support for increased bicycle enforcement, according to one attendee. Mannix has also defended officers accused of blaming a cycling couple who was harassed by a driver, and wrongly cited the CA vehicle code to say they shouldn’t have occupied a traffic lane. Countless stories have been told illustrating anti-bike bias entrenched among many officers at the SFPD. Calls for bicycle enforcement at stop signs and red lights from Captain Sanford sparked a “civil obedience” demonstration Wednesday of the impractical stop sign law for bikes. Sanford was the first to transpose “the five” crash data to bikes after becoming captain in April at Park Station, which had a “five” citation rate of just 28 percent last quarter. 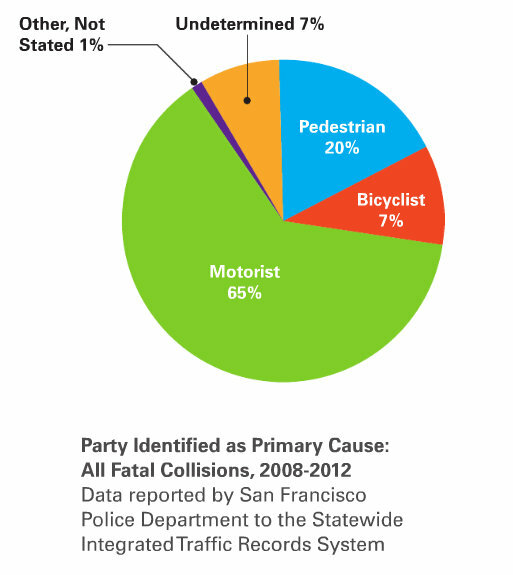 SF drivers hit as many as 900 pedestrians each year, or nearly three a day. Several hundred are severely injured, and in many years, some two dozen are killed. According to the city’s Vision Zero Two-Year Action Strategy [PDF], motorists were at fault for 65 percent of fatal crashes in 2013 and 2014. “The data that established the Focus on the Five was based on data specific to vehicle violations,” said Walk SF Executive Director Nicole Ferrara. In collisions between drivers and bicycle riders, fault “seems to be evenly split among bicycle riders and motorists,” the report said. SFPD data from the second quarter [PDF] of this year shows the share of “five” tickets increased to 32 percent, following a decline of 6 percent last quarter to 24 percent, when police issued more citations to pedestrians and bicyclists (which are, again, categorized separately). Richmond Station’s rate climbed to 63 percent, while Northern and Ingleside Stations also led with increases to 41 and 40 percent, respectively. The SFPD’s quarterly reports are “an important accountability tool to monitor how citations administered reflect behaviors on the road that contribute to injury and death,” said Megan Wier, an epidemiologist at the SF Health Department who analyzes the police data on pedestrian injuries behind the “Five” program. But the SFPD’s top brass isn’t just talking about diverting resources to issue more tickets for vulnerable road users for violations that don’t hurt people. They’re taking it a step further with a disingenuous attempt to put a positive spin on enforcement efforts that are counterproductive at best. The SFPD’s own data-driven policy calls out everyday reckless driving as the largest danger facing people on SF streets. Resisting compliance with that policy seems to indicate just how pervasive the windshield perspective remains throughout the department’s ranks. Perhaps SFPD officials merely see their alteration as a way to fudge numbers, but undermining the entire premise of a targeted campaign to save lives — and pretending it was never changed — signals a profound sentiment of denial, and a patronizing response to the public’s calls for safer streets. If you don’t think there is a difference, I’ll make a wager with you. We’ll both stand in a crosswalk. We’ll get someone in a car to do a rolling stop over you, and someone on a bike to do a rolling stop over me. Winner is whomever doesn’t end up dead. Pickey, if you can’t tell the difference between a car and a bicycle, then you really need to get your eyes checked. A car has 2,000 lbs and about 5 feet of width on a cyclists. No one here is saying that a cyclists shouldn’t yield to cross traffic and to pedestrians. What is being said instead is that cyclists should slow, look each way and move carefully though open, clear intersections. Bicycles are inherently are different vehicles from cars and have different requirements and risks to those around them. They are already treated differently than cars under traffic laws and there is no reason why a “foot down full stop” at every intersection should be required. End of the day, I rather not be run over by either. So respect the STOP sign and do a complete stop as required by law. Or you can join us and walk instead. @Donovan Lacy – I recently read that the realistic time frame is 3 years. Here we are, 3 years later, lots of people biking those lanes and it would probably be good to find those numbers. Not much protection on Howard Street, though, which is the return trip.